What’s always on Willie Nelson’s mind? In honor of his receiving the 2019 Producers & Engineers Wing Award, we take a look at some important causes closest to the country troubadour’s heart. 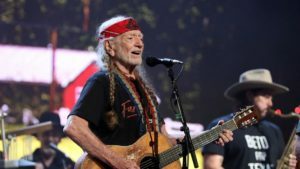 At 85, Willie Nelson would be forgiven for resting on his laurels, but the legendary country outlaw shows no signs of slowing down. He remains as engaged as ever, releasing not one but two studio albums last year and passionately championing charities and causes close to his heart. In addition to his prolific output, Nelson has long been known as one of music’s biggest activists and philanthropists. On Feb. 6, the eight-time GRAMMY winner will be honored with the 2019 Producers and Engineers Wing Award to celebrate his artistic achievements. As Recording Academy President Neil Portnow said, Nelson “has inspired generations of musicians and fans, and continues to set precedents of excellence within the music community”—but his work outside the music community is remarkable as well. So to highlight all the important work he’s done advocating outside the industry, we’re taking a look at some of his favorite causes. Perhaps Nelson’s best-known cause, Farm Aid has been active for over 30 years, beginning in 1985 as a benefit concert organized by him, John Mellencamp and Neil Young to raise money for family farmers. After the first Farm Aid concert raised over $9 million, Nelson and Mellencamp brought farmers to testify before Congress, sparking the passage of the Agricultural Credit Act of 1987 to help save family farms from foreclosure. Farm Aid’s farm disaster fund helps provide money to farmers who lost their crops through natural disasters. The organization’s board of directors includes Nelson, Mellencamp, Young and Dave Matthews, and they work together to put on the annual fundraiser concert, which will enter its 34th year in 2019. This entry was posted on Monday, January 28th, 2019 at 8:21 pm and is filed under News and Reviews. You can follow any responses to this entry through the RSS 2.0 feed. You can leave a response, or trackback from your own site.